Posted on January 20, 2014 by J. 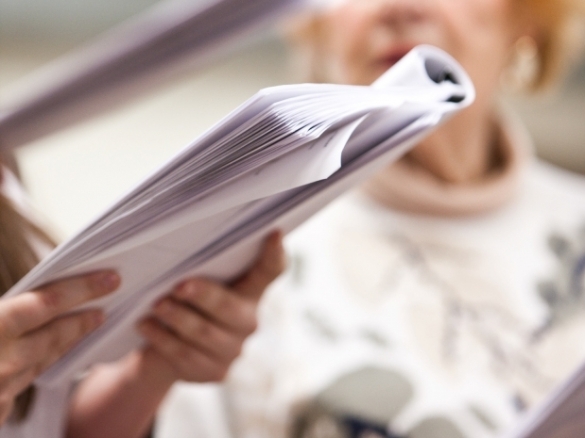 Actors love to read along in the script, even when it isn’t their line. One character may have a monologue that lasts a half page, but in the early rehearsals, every other actor on stage with her will read along in the script for the entire speech as she says her lines. Never mind that you can listen better when you aren’t reading; if you have a script in your hand, the natural thing to do is to read along silently when it’s not “your turn”. The problem is that it’s always your turn. Just because it’s not “your turn” to speak doesn’t mean it’s not your turn. It’s your turn to listen. To receive. To process. To experience. To feel. In real-life conversation, we don’t bow out just because we aren’t talking and tune back in when the other person stops speaking. We are fully engaged in the conversation, in listening to what is being said and then responding to what we hear. Okay, we do tune the other person out a bit at points in our conversations, usually when we’ve decided (rightly or wrongly) that we understand what they’re saying, and we start to think about what we want to say when we manage to interrupt them. In real life, we aren’t the best listeners. On stage, you have to become one. Because it is an artificial situation, where you are trying to stay present to the moment and not leap ahead into a future you already know (because the playwright has given it to you), you have to be a great listener on stage. You have to lose the habit of preparing what you’re going to say and instead let your speech come out in the moment the playwright has scripted IN RESPONSE to what you have gotten from the other actor. Let me say that again: Anything you say must be IN RESPONSE to WHAT YOU ARE GETTING FROM THE OTHER ACTOR. You have to give your emotions a chance to rise up in you. Because you aren’t really the character, because you don’t have their history, because the words your “ex-lover” is saying to you don’t have the sort of power they would in real life, you have to make room for the “what if I was” emotions to show up. Give them space and give your full attention to your circumstances, and they will. But you can’t do that with your nose in a book. Emotions are not an intellectual choice you make by deciding what the written words mean. They are generated in us by what other people – not scripts – say and do.